Cask Strength to Play World Record Breaking Dance! The band have the honour of playing for a world-record breaking attempt at the largest Strip the Willow ever attempted! 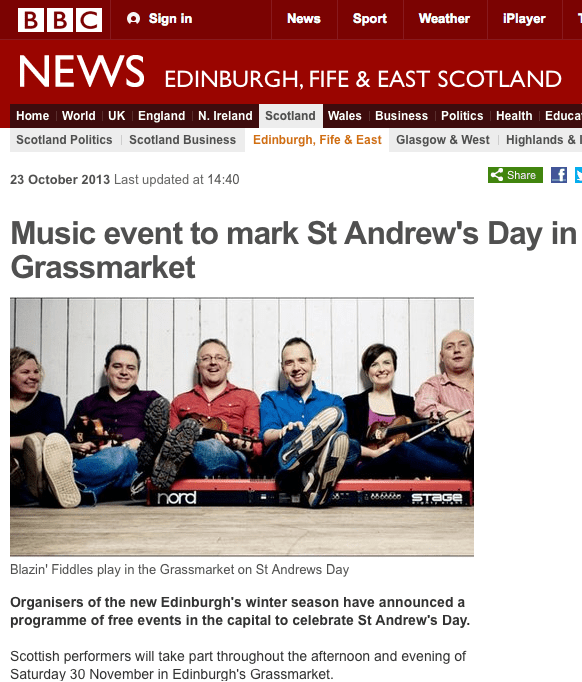 The St.Andrew’s Day street party in Edinburgh’s Grassmarket will be one of the highlights of the years cultural celebrations, featuring acclaimed Scottish singer Dougie MacLean (writer of hit Scottish song ‘Caledonia’). Dougie will be joined by Admiral Fallow frontman Louis Abbot and leading Scottish folk bands Blazin’ Fiddles and Breabach! The Cask Strength Ceilidh Band will play at a massive kids ceilidh during the day, and will be joined by mighty fiddler Adam Sutherland for the big dance later on! More info here. Should be quite a spectacle! However, the Orcadians’ in Kirkwall have surely set us all an impossible task – and I do believe similar attempts have been made on both the wee Isle of Gigha at the mighty music festival there, as well a huge one for Oban’s Bicentenary Celebrations. This entry was posted in See us play live! on October 30, 2013 by admin. Here is the live video of Mhairi and David Hardie’s wedding at Aultmore House in the Cairngorms! What a fabulous setting for a wedding! This entry was posted in See us play live! on September 19, 2013 by admin. What a great night we all had at the beautiful Pollockshields Burgh Hall on 11th August! Congratulations to the happy couple Blair and Megan Taylor! Lovely people and great dancing all round. Thank you so much for having us and best wishes! Hamish, John & Stevie. This entry was posted in Weddings on August 19, 2013 by admin. Thank you kindly to the Merlin Academy of Traditional Music for the use of their beautiful space at The Wynd Theatre. This entry was posted in See us play live! on July 22, 2013 by admin. The following day the band enjoyed some croquet on the front lawn of Aultmore House in the glorious sunshine with the wedding party! Spiffing! …live video of the wedding dance coming soon! This entry was posted in Weddings on June 13, 2013 by admin. This entry was posted in Other on February 8, 2013 by admin. The Cask Strength Band are delighted to launch their new website by ace Glasgow-based designer Somhairle MacDonald. We look forward to delivering more great fun performances at home and abroad in 2013! This entry was posted in Other on February 5, 2013 by admin. As highly regarded musicians on the Scottish music scene all three members of the Cask Strength CB will be involved at the World Renowned festival of Celtic music which takes place this January in Glasgow. During the festival one of the Cask Strength lads is up for a BBC Radio 2 Folk Award, while the others are being filmed for BBC Alba Gaelic TV, singing in Kelvingrove Art Gallery in Andy Thorburn’s ‘New Voices’ choir or performing live on BBC Radio 3 ‘World on 3’ programme. This entry was posted in See us play live! on January 15, 2013 by admin. Any one tuning in to BBC Alba on Hogmanay would have caught Hamish forming part of the house band for their live broadcast. He was joined by many of the best players in the Scottish and Folk music scene for a night of music and general Highland hilarity. This entry was posted in Other on January 15, 2013 by admin.